Posted on October 29, 2010, in baking, Cake, cupcakes, Edible projects and tagged baking, beetle, cake decorating, cupcake, Halloween, marzipan. Bookmark the permalink. 27 Comments. I agree with you about the red velvet and food colouring. I’m laughing because I sometimes send things in for my husband’s work mates (many different nationalities) and cannot imagine what they’d think if they received cakes with edible beetles on them! I’ve got some of the edible lustre so might have to find time to make some for them as well as the trick or treaters. I didn’t think about the cochineal connection to Red Velvet cakes! What a fab idea! Need to try these out! I haven’t seen black cocoa for sale over here. I love these! Last night I made the ‘Dracula’s bite’ cakes from my Zombie book…. Such funny cakes but some are just a little too effectively gross looking! ha ha!! Originally Hubs wanted me to make the heart cakes that featured in the book, but I couldn’t get one of the ingredients that would give it the authentic wet look. For bugs, those are certainly good looking! Dare I say yum? 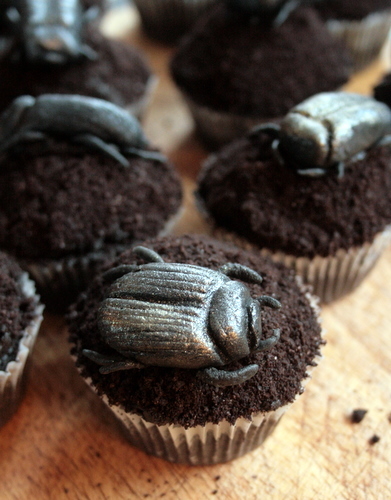 How ADORABLE are you black velvet beetle cakes?! totally original and Halloween-y but not *too* Halloween-y. No pumpkin in sight – good work! These are lovely, fantastic. Also I find Nigella’s Guinness chocolate cake comes out really darkly coloured so then you could escape from adding extra food colouring. I’m with you on the Red Velvet by the way, I was distraught when I discovered it was just chocolate and food colouring, I had hoped it would be something really special. Sad times. I have a total phobia about insects. 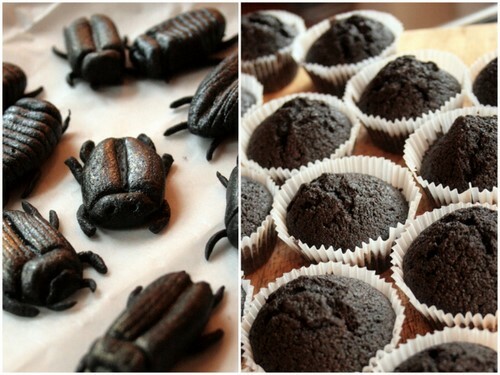 These beetle cakes MADE MY DAY. I’m still shivering with horrified delight. I’m so glad you like them, even if you are horrified! 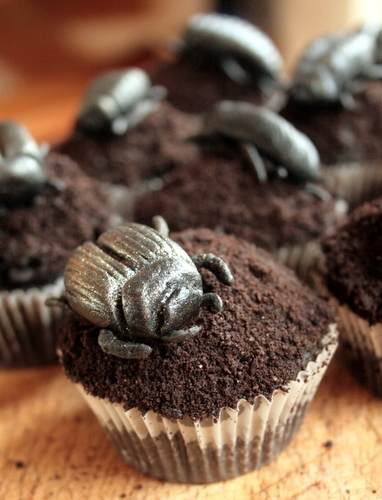 Some of Hubs’ workmates refused to eat the cakes because they were so freaked out by the beetles. In a true macarbe twist the cakes did contain real beetles thanks to the cochineal I used to help darken the cakes. These beetles are making a reappearance this Halloween on a black forest gateaux style cake.